The Warren Ball Park in the Warren District of Bisbee, Arizona is the oldest professional ballpark in Arizona. In 2009, we celebrated its 100th birthday. To read more about the history of the ballpark and the famous players, including Babe Ruth – click HERE. 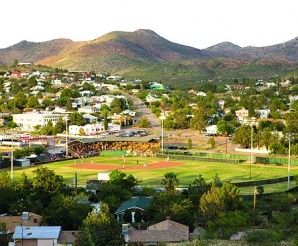 The Warren Ball Park is the home of the newly formed Bisbee Ironmen. Doubleheaders will be played every Friday and Saturday until July 6th. The week following will be tournament week. Schedule is subject to change. So chick HERE to check the most current schedule and the tournament schedule. You can also call 520-432-4372 for more information. The Bisbee Ironmen are also on facebook: https://www.facebook.com/bisbeeironmenbaseballinc. Here you will see profile photos of the players as well as the players in action. Some of the players are staying at the Gym Club Suites until July 15th. Come say hello and get your baseball/cards autographed. Warren Ball Park is also the home of the annual Copper City Classic Vintage Baseball Tournament. The tournament is normally played at the end of March or the first part of April. Read about the successful tournament in 2013 – Tournament, and see photos too. The ballpark has been a venue for other events, such as the Bisbee Blues Festival (September 2009-2012) and Bisbee Youth Day (July/August 2012-2013). During school year, it’s also the home of the Bisbee Pumas football team. Directions from Old Bisbee: 80E to traffic circle. Take 2nd right onto Bisbee Road. Continue on Bisbee Road until it becomes Douglas Street. Douglas Street will end at the ball park.